The Palestinian village of Kafr Qassem, east of Tel Aviv was stormed by Israeli settlers Sunday, who vandalized many cars, local sources told Maan News. 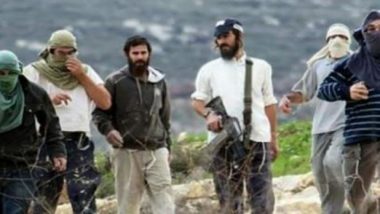 Dozens of settlers reportedly punctured tires of 32 vehicles belonging to Palestinians, and spray painted threats and racist slurs. Some of the slogans that damaged local property included “Death to Arabs”, and “We will take revenge” left on the walls and vehicles in the neighborhood. The Israeli Police was called to the village, and said it was reportedly initiating an investigation into the attack. These types of attacks are frequent in the West Bank, including occupied East Jerusalem, and target homes, vehicles, lands, graveyards, and holy sites. On November 30th, a group of illegal colonialist settlers infiltrated into a Palestinian village near the West Bank city of Bethlehem, punctured tires of several cars, and wrote racist graffiti. A similar attack was carried out on November 23rd, in Huwwara and ‘Aseera al-Qibliya villages, south of the northern West Bank city of Nablus.